I believe part of the answer to bringing the current teacher bashing and testing obsessed edreform movement to its senses lies in reminding people, from politicians to parents, why teachers teach. Well, I just went out for a pre-dawn walk. After being spoiled by ten idyllic days of walking the cool, inviting, gnatless, mosquitoless environs of Seattle’s streets and Vancouver’s Stanley Park, my body had seemed to know what torture it was about to endure. I had started sweating before my hand was on the door knob. It is hot down here! It is humid down here! It was like slogging through a paved rain forest. And, the sun hasn’t even come up yet! Anyway, as I was hoping against hope that the heated asphalt wouldn’t fry the soles of my feet before I finished my route, I was thinking about a question raised by a student in my class yesterday morning. I think he and the others were intrigued by the four days scheduled in the syllabus of what I call “stuff,” those bonding and trusting exercises with which I begin all my classes. It’s my way of starting to replace what I think is the strangling atmosphere of isolating, destructive classroom competitiveness with the sweet smelling air of a mutually supportive and cooperative learning community. He wanted to know what I thought it took to be a collegiate history teacher. I told him that I would have to reflect on that question and would bring in an answer today. I’m sure he and the others are expecting me to talk mundanely about techniques, courses to take, areas in which to major, advanced degrees to acquire, research in which to engage, stuff to publish, and so on. But, I don’t think I will because I don’t think the essence of teaching lies in the “doing,” that is, I don’t think teaching begins with, is and ends with technique. Nor do I think the seminal issue of teaching lies in the “knowing,” that is, having a grasp of the subject and the subject content of the course. Certainly both technique and subject are important, but I think teaching, and learning for that matter, ultimately rests on “self.” I think the essence of teaching and learning lies in the “feeling” and the “being,” that spirit which surrounds each of us, which brings life and meaning and purpose into the learning experience, and which creates that critical common bond of humanity among the students as well as between them and the teacher. If you want to be a teacher, you first have to learn how to play hopscotch, jump rope, ride-and-seek, learn other children games, learn how to watch a snail crawl, blow bubbles, read “Yertle the Turtle”, and watch “Bullwinkle”. If you want to be a teacher, you have to sing “she loves me, she loves me nots” as you blow at a dandelion or pull the individual petals of a daisy. It you want to be a teacher, you have to stop and watch a rainbow, listen to a distant train, wiggle your toes in the mud and let it ooze through them, stomp in rain puddles, look up and watch an airplane, and be humbled by the majesty of a mountain. If you want to be a teacher, you have to fall in love each day. If you want to be a teacher, you have to paddle a canoe, take a hike, or just get out. If you want to be a teacher, you have to watch intently the artistry of a spider weaving its web. If you want to be a teacher, you have to fly a kite or throw a frisbee, skip stones in a lake or brook, make sand castles, and love people. If you want to be a teacher, you have to listen intently to the rustle of the leaves, to the murmur of the brook, to the pitter-patter of the rain, and to the whisper of the breeze. If you want to be a teacher, you have to dream dreams, play games, talk to the flowers, catch fire flies, admire a weed, walk barefoot, hold a worm, and see what is yet to be. If you want to be a teacher, you have to think silly thoughts, have a water gun fight, have a pillow fight, swirl a tootsie pop in your mouth, burn sparklers at night, and see in a tree more than a mass of atoms or so many board feet of lumber or something that’s in the way. If you want to be a teacher, you have to skip as you walk, laugh at yourself, smile at others, hang loose, always have an eraser handy, concoct an original recipe. If you want to be a teacher you have to be inspired and inspire. If you want to be a teacher, you have to fix a bird’s broken wing, pinch the neck of a deflating balloon and play a tune, do zany things, play with a yo-yo, and lose yourself in the quiet scenery to find yourself. If you want to be a teacher, you have to feed the pigeons or squirrels, sing in the shower or tub, smell the flowers, play with finger paints, and do a belly flop in a pool. If you want to be a teacher, you have to bring joy into everything, watch in awe a sunset or sunrise, ride on a swing, slide down a slide, bump on a seesaw, and respect even a cockroach as a miracle of life. If you want to be a teacher, you have to ride a bicycle or roller skate or ice skate, and live today. If you want to be a teacher, make all those marvelous feelings and images an intimate part of you and bring them into the classroom with you and share them. If you want to be a teacher, as Carl Jung advised, you have to put aside your formal theories and intellectual constructs and axioms and statistics and charts when you reach out to touch that miracle called the individual human being. 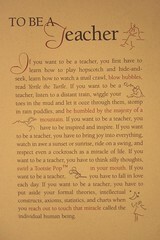 That’s what I am going to tell my student about what it will take to be a teacher.